The grant for $1 million is part of the agency's Next Generation Machines: Enabling Technologies initiative. 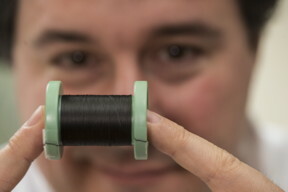 It will help Rice Professor Matteo Pasquali and his colleagues improve on the nanotube fibers they introduced in 2013. "Our carbon nanotube fiber technology is already at the leading edge for such new applications as medical electronics, wearables and electronic textiles," Pasquali said. "With conductivity improvements of 20 to 30 percent, we can greatly expand the application range to include metal wire replacement for mobile applications." Pasquali is a professor of chemical and biomolecular engineering, of materials science and nanoengineering, and of chemistry and chair of Rice's Department of Chemistry. Kono is a professor of electrical and computer engineering, of physics and astronomy and of materials science and nanoengineering.